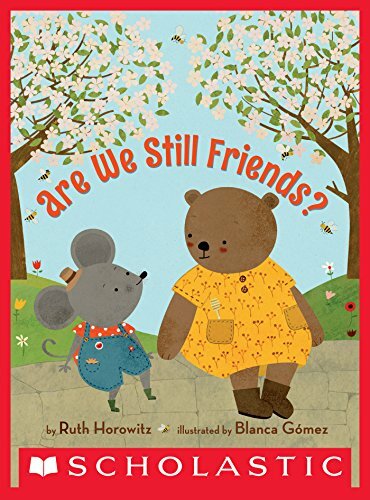 We are thrilled to present Ruth Horowitz who is the author of ARE WE STILL FRIENDS and many other books for children. Enter the Rafflecopter below for a chance to win a copy ARE WE STILL FRIENDS! I am the daughter of a school librarian and a newspaper editor, and I have happily held both those jobs, as well. But while those were my parents’ careers, for me they were day jobs to support what I’ve always felt was my “real” job, which was writing. I took a bunch of creative writing courses in college and tried my hand at adult short stories and a YA novel. Then I got a job as a children’s librarian and became a mother, and found myself immersed in picture books. One day, while I was taking my baby daughter for a walk, the text of a book called Mommy’s Lap came to me. Lightning struck and the second publisher I sent it to picked it up. I continue to write in a variety of genres, but children’s books – and picture books specifically – is where I’ve had the most publishing success. Congratulations on your book, ARE WE STILL FRIENDS?What inspired this story? Thanks! I wrote the first version of this book way back in 1991, when my kids were little and we were living in Vermont. Our family went apple-picking, and I noticed that the orchards sold honey alongside the apples. It was close to Rosh Hashanah, the Jewish New Year, when it’s traditional to eat apples dipped in honey – and also a time for atonement and reconciliation. 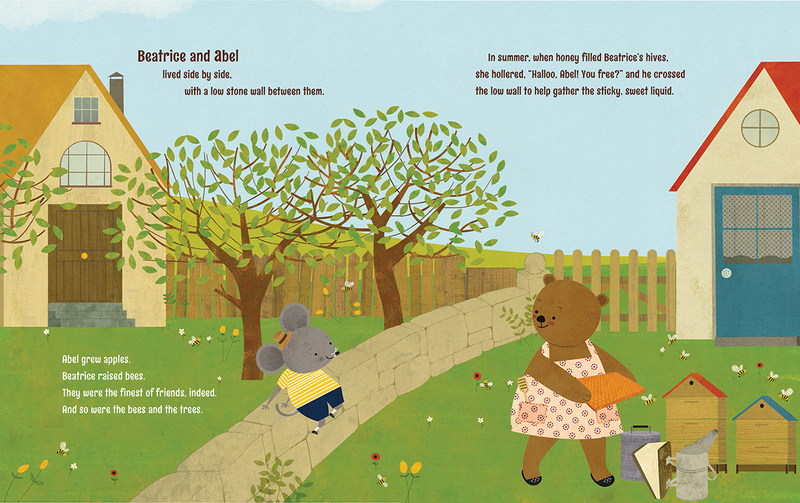 I thought about how bees and apple trees need each other, and how people need each…and a story was born. Tracy Mack, my editor at Scholastic, recognized the book’s core friendship story, and helped me to highlight that theme. Was your road to publication long and winding, short and fortuitous, or something in between? All of the above. When I sold my first book right away, without an agent, figured I had it made. But for various reasons, it took nearly eight (8!) years for that first book to be released. Over the next 10 years, I published another four kids’ books, all but two of them with different editors at different publishers – and I wrote a lot of other books that never found publishers. I took time off from kids’ books to work for a newspaper and to write a novel for adults before finding my way back to kid lit. So yes – my road to publication has been both short and fortuitous and long and winding. My debut middle-grade novel is currently out on submission. I’m putting the final touches on a couple of new picture books, and at the earliest development stages of a new middle-grade novel. What is the hardest part about writing picture books? They’re so short! When I started out, it wasn’t uncommon for a picture book to run to 1000 words. Now the upper limit seems to be around 500 words. I write long and cut. And cut. And cut. It can be painful. But it helps to imagine how the illustrator will fill in the blanks. They’re so short! I love that you can read a picture book all the way through in just a few minutes. It makes it so easy to see the story arc and hear the rhythm of the language, and to figure out how to make work. Writing is the cake. Publication is the icing. I am a terrible speller. Vowels are killers. Ruth Horowitz is the author of six children’s books, including ARE WE STILL FRIENDS (Scholastic, 2017), and CRAB MOON (Candlewick, 2000). She grew up in New Jersey, graduated from Hampshire College – where she studied creative writing with John Irving -- worked as a school librarian in Los Angeles, and raised her children in Vermont. She now lives in Rhode Island with her husband. Looks like a very cute book. Congrats! Thanks for sharing your journey. I love your statement Ruth, 'Writing is the cake. Publication is the icing.' Best of luck with your next projects! I loved your advice to aspiring authors, Ruth. I'm looking forward to reading Are We Still Friends. Good luck on your MG and PB projects. Thanks, Danielle, Traci and Tracey! This looks so sweet! Can't wait to read. Congrats on the new release, Ruth! Those are charming illustrations! Thank you for the contest! I think writing picture books is really difficult because of the word count. I'm studying as many as I can by reading them without the illustrations to "see" what just the text is. Congrats on your books and I look forward to reading them. I enjoyed reading your post, Ruth. The book looks darling. So cute! And thanks for the reminder that publication is the "icing." Thanks for sharing your super sweet book and your thoughts, Ruth. Thanks, Cathy, Angela and CL! Lovely story about your path of writing and publication. This book sounds so adorable! And I love the "writing is the cake, publishing is the icing." Perfect. Thanks for sharing!